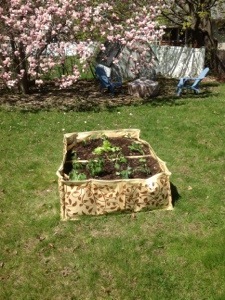 Yesterday I had the pleasure of working with a fun young couple in Glens Falls, NY (in the capital region) to co-create their first organic edible garden. The couple happen to be newlyweds and new homeowners, and joy permeates their property in a palpable way. It feels like all the edible gardening here will do very well. We started with a standard non-permanent raised bed, filled it with organic soil, organic herbs and vegetables and used traditional companion planting strategy that takes so much of the guesswork out of growing organic produce. 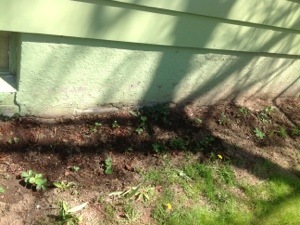 The south side of their home has sandy soil so we decided to plant a flat of 48 June-bearing strawberries. These will tolerate the dry soil and sunny exposure. 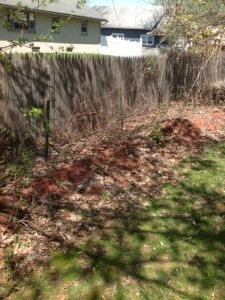 Organic gardening is often just about working with what is already there, playing the hand nature deals you. 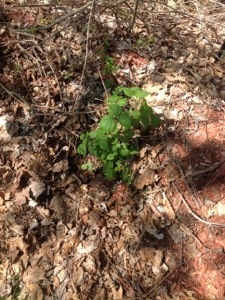 Along the back property line we planted a native Lowbush Blueberry, a native Flowering Raspberry and an Everbearing Raspberry. These will make a nice edible garden border and by leaving the area a little messy we encourage habitat development of wildlife. This is a smart perennial organic produce system; planting perennial edible gardens ensures fruits for smoothies, juice and pies in future years.